I can’t believe we are already nearing the end of our first month of the The Organize & Refine Your Home Challenge . During our organizing foundations month, we’ve completed our decluttering prep work, perfected our planning system, and created/tweaked our household command center. The last assignment in the foundation phase of the challenge is to create an official household drop zone. You know that tendency that you & your family members have to drop everything that’s in your hands in a pile somewhere just as soon as you come through the door at the end of the day? 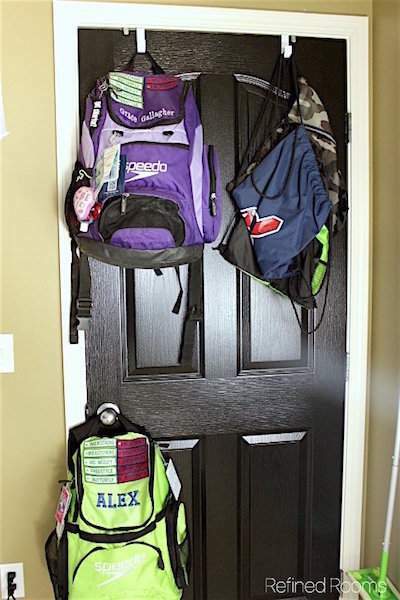 A household drop zone makes that annoying pile go away AND makes locating those essential items that you need when you’re rushing out the door quick and easy. As you determine where to create your drop zone, you’ll need to work with your home’s layout and your family’s natural tendencies. The best location for your household drop zone is near your family’s natural dumping spot, which is typically immediately inside the door that you most often use to enter your home. 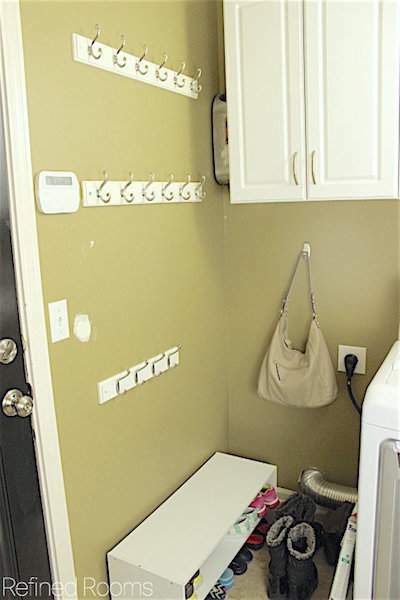 Common household drop zone locations include the garage (the area right outside the door leading into the home), the mudroom, a foyer/entryway, back hallway, or the kitchen. 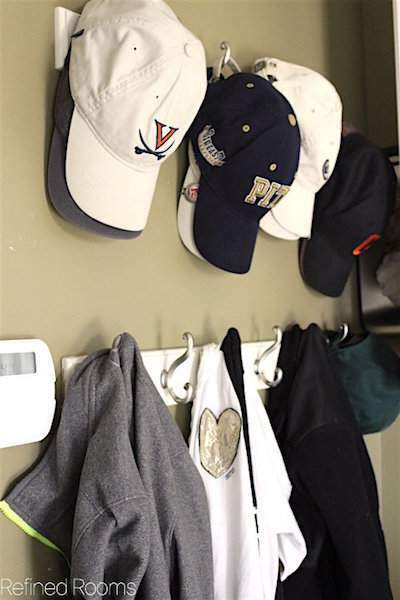 When it came time to establish our household drop zone, it really was a no brainer, since we enter our home through the garage into our combination mudroom/laundry room about 99.9% of the time. The items you choose to store in your household drop zone will depend on what stage of life you’re in, what you routinely carry with you while traveling out the door each day, as well as the current season. I’ll give you a tour of our drop zone to spark some ideas as you begin to plan yours. You all know how I love to store things on the backs of doors. The mud room is no exception. I use a set of Thirty-One Oh-Snap Pockets on the back door leading into our garage for storage. The top pocket is used as an Outbox to hold things that I need to take with me on future outings (e.g., outgoing mail, store returns, etc). 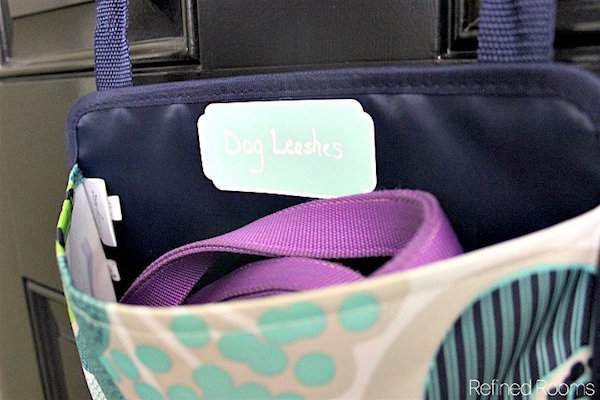 The bottom two pockets serve as our “Bella Zone”, where we store the dog’s leashes and outerwear for walks on those cold winter days. To the right of that door is the meat and potatoes of the drop zone, which consists of a series of hook rails for storing the boys’ ball caps, the kids’ frequently used coats (based on the season), and their back packs. I also store my purse on an oversized Command Hook to the right under the cabinets. In the corner, you can snag a peek at my grocery bag dispenser where we store all of those grocery bags to reuse for various purposes around the house. Below the hook wall is the shoe storage zone for the kids’ shoes. 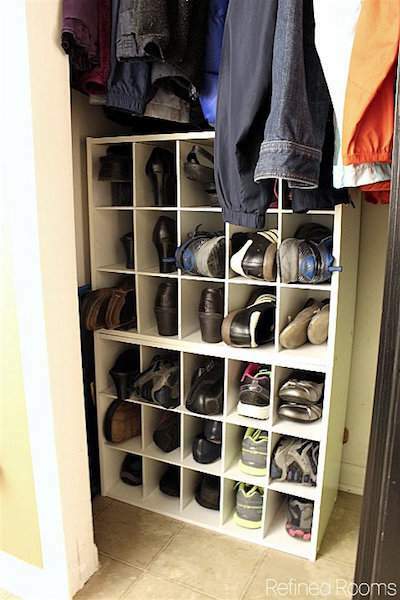 This stackable shoe organizer does the trick for maximizing the available space. Moving clockwise around the room (skipping the washer/dryer wall), we come to the door that leads from the mud/laundry room into the kitchen. 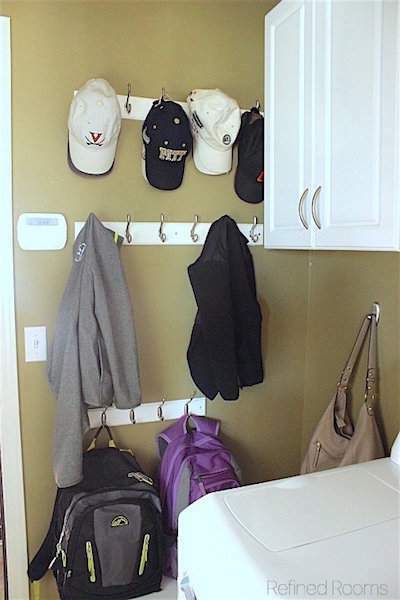 I use a pair of simple over-the-door hooks to store the kids’ swim bags (that are used pretty much on a daily basis) and some random drawstring bags. Turning clockwise once again, we come to our large coat closet (you can check out how we organize this coat closet here), which is where the grown-up (in season) shoes are stored using a pair of stackable shoe cubbies. Out-of-season shoes live in our bedroom closets. The grown-up (in season) coats are also stored in this closet. 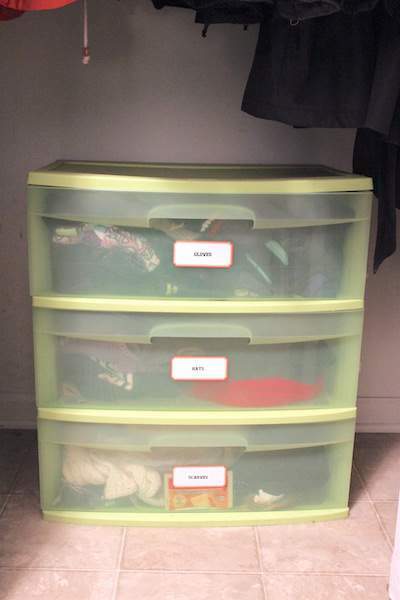 At the bottom of the closet, I use an inexpensive plastic drawer unit to store our gloves, hats, and scarves. 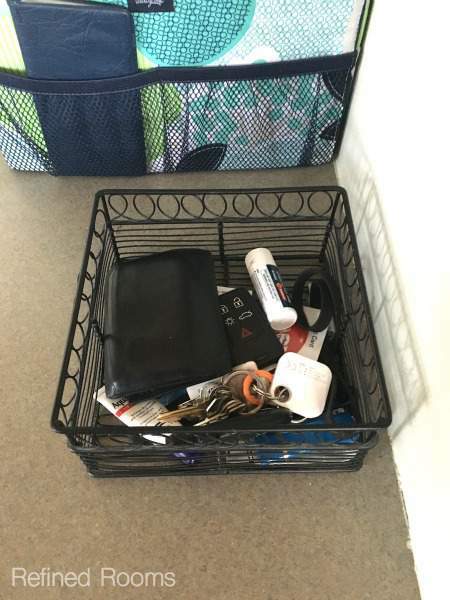 Ideally, we would store my husband’s keys and wallet in the drop zone, but I don’t want to mess with the “good thing” we’ve got going with this simple basket he uses in the kitchen desk area to store these items. There’s just no good place to put the basket in our mud/laundry room, so on the kitchen office desk it shall stay. Our family’s drop zone reflects our specific needs and yours should as well. If you’re a family with young children, you won’t need school backpack storage quite yet, but you WILL need a place to store the diaper bag. If your kids participate in sports that involve big, bulky equipment (e.g., hockey, football), you’ll need to designate a consistent home for those items (perhaps in the garage). You get the picture. Also, I’d love it if you’d share an image of your drop zone in action on Instagram (use the hashtag #OrganizeandRefineChallenge). I can’t wait to see how the drop zone plays out in your home! Great photos and wonderful tips about setting up a drop zone. I especially like the plastic drawers to hold gloves, hats & scarves. 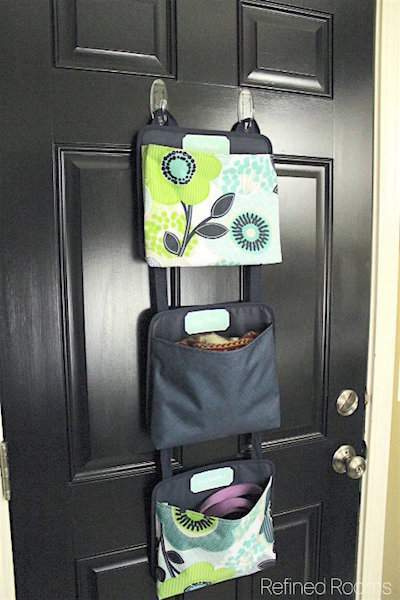 The Thirty-One Oh-Snap Pockets for holding outgoing items is another great storage solution. Glad you found the post helpful Nancy! That dream drop zone photo was rather amazing! But I appreciate how you creatively utilized your available space with very affordable options. Those shoe cubbies are so handy. I think the most important factor for success is matching your family’s natural drop habits with simple storage solutions. At first I was jealous because I’ve never lived ANYWHERE with that kind of space near the entryways, but then I saw your suggestions for back-of-door and closet-floor storage – brilliant! Something for everyone… thank you. Yes, you can store so much on the backs of doors. It’s such an underutilized space. We need to come up with better solutions for our drop zone. It’s a hot mess by the end of every day. I do love that shoe cubby idea. Yes, I don’t know what we’d do without those shoe cubbies. They rock! You have shared some great tips. I don’t have such a large area but I will take this information and work it for my spot. Thanks for sharing.